Posthumous prints of music by the recently deceased often consist of offcuts and dredgings-up from the bottom of the drawer, not to say spurious pieces. 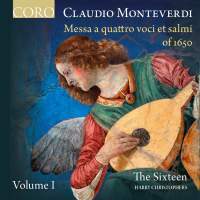 Published in 1650, seven years after Monteverdi’s death, the Messa a quatro voci et salmi is an exception, its contents fine enough to have secured a foothold on disc. Here, The Sixteen plug a gap in the current discography by offering the entire set (a companion volume is anticipated). They include Cavalli’s fine Magnificat, which appears in the print but was omitted on the only previous ‘complete’ recording of which I am aware (in any case no longer readily available). The Sixteen’s complete recording of the Selva morale collection has been praised in these pages, and the qualities of ensemble are certainly worth noting here also. They are heard to best effect in the more richly scored pieces: the five-voice Laetatus sum and Laudate pueri, for example, or the Cavalli Magnificat). That said, one misses the incisiveness of earlier interpretations in similar repertory (the Taverner Consort, notably, or more recently Concerto Italiano), or of much of The Sixteen’s own Selva volumes. Much the same might be said of the pieces for vocal duos and trios: The Parley of Instruments for Hyperion with Emma Kirkby, Ian Partridge and David Thomas polished some of these off with more gusto, and rather more cleanly (though The Sixteen’s two basses acquit themselves with greater credit). These are serviceable accounts but not quite the finished article.